Tucked away in a white brick courtyard at the Notting Hill end of Portobello Road, you can easily miss the Farm Girl Caféentrance and instead get entangled in the throngs of tourists all photographing the rows of pastel coloured houses. Make sure you seek out this green-tiled haven; the service is sunny, charming and relaxed, possibly because Rose, the Farm Girl herself, is from Melbourne and Stacey (front of house) and Stuart (barista) are also from Australia. So the vibe is friendly and warm but efficient. There’s a huge breakfast and café culture in Australia, trending in healthy and nutritional dishes and focusing on seasonal eating. Which may be great when the sun shines 365 days a year and you have a beach on your doorstep but it can get a little pious when you live in the UK and just want to eat cake. So fear not, Farm Girl achieves both and presents the superfood healthy dishes in such a pretty and enticing way it doesn’t feel like you are being deprived. But my absolute favourite breakfast recommendation is a special of Avocado on Sourdough toast topped with perfectly poached eggs. Huge, filling and delicious. 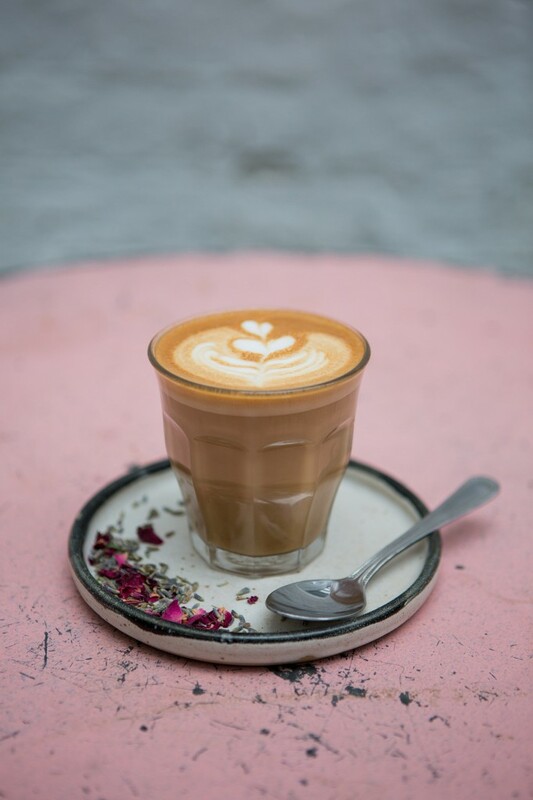 Naturally you’ll need a beverage or two, Latte’s are perfect and if you are feeling a little more adventurous there’s the Rose Latte, it was a little too perfumey for me, but if you like Rose flavouring this could be the one for you. The Acai Bowl is deep purple, and topped with colourful goji berries, chia seeds, banana and coconut. It does indeed include three superfoods but it’s satisfyingly sweet, pretty as a picture and served in a huge bowl. Apparently Acai is packed with antioxidants and it’s great for your skin. It was a pleasure to eat. There’s the House Granola, if you want something a little more traditional a nutty blend of oats, elderflower & orange zest, served with natural yoghurt & a sprinkle of berries. And as I mentioned there’s plenty of treats on the menu, from Carrot Cake to Chocolate & Blueberry Cake, sprinkled with edible glitter and why not have a little sparkle over brunch? Accommodating specific dietary requirements is also done with ease, barista Stuart made me a Coconut Milk Hot Chocolate, it seemed so rich and indulgent but he explained the sweetness came from date syrup and the chocolate was raw cocoa. Discreetly far more healthy than I could have imagined. The Farm Girl mascot is Bronte, a grey velvet French bulldog; his latte art image is optional.